Christopher Columbus was an Italian explorer, navigator, and colonizer, born in the Republic of Genoa. That area is now called Italy! Under the patronage of Queen Isabella I of Castile and King Ferdinand II of Aragon he completed four voyages across the Atlantic Ocean that led to the European awareness of the American continents. Those voyages started the Spanish colonization of the New World. 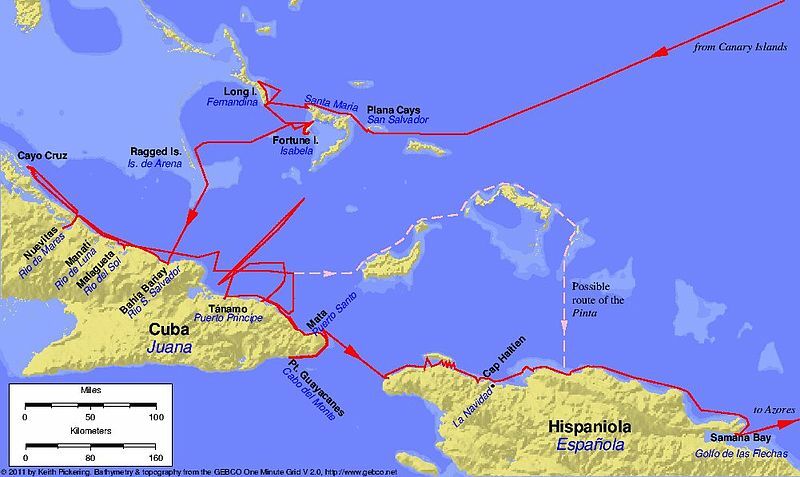 On August 3rd 1492, Columbus sailed from Palos, Spain with three ships; the Santa Maria, the Niña and the Pinta.Columbus was in search of a westward route to Asia. Asia was the land of spices! Cinnamom, tumeric, black pepper, tea, cloves, and nutmeg were just a few spices that were valuable. European countries used trade to gain wealth, so these spices and other resources were very important to them. A trader would want to buy items in Asia and sell them in Europe to make a lot of money. Columbus was so confident that he would reach India that he brought an Arabic translator along on the trip. Of course, when he finally found land two months later, it wasn't Asia at all, but what would eventually be called the Bahamas. Columbus made four trips across the Atlantic Ocean from Spain and although he never really "discovered" the Americas, because thousands of people already lived there, he did bring awareness of the "new world' to Europe. Columbus and his sailors sailed bravely into the unknown. Columbus did not give up, even when people laughed at his ideas. After Columbus discovered the "New World", rulers from around the world sent explorers and small armies to the newly discovered continent to establish outposts, spread religious beliefs, and seek treasure. The Indian civilizations of South and Central America were prime targets for invasion because of their abundance of gold and silver. Explorers brought home gold, new foods and new knowledge. However, they brought misery to many Native Americans. The Europeans took their land. Many Native Americans were killed in wars with the Europeans, or died from European diseases.